It took two years of working with a machinist friend to craft the aforementioned closet doorstops, bumpers and bottom glides. The winning combo was brass stops with rare earth magnets, UHMW bumpers and, for the glides, stainless steel pins that ride in UHMW tracks routed into the bottom of the doors. Easy. It’s no wonder it took them four years to almost finish the remodel of their Seattle gem. Volkstorf admits he revels in finding the house fittings that you supposedly can’t get anymore and has launched a consulting business for owners of midcentury homes facing the same dilemmas. Case in point, the sheer, organic, natural curtains he envisioned for the window walls. After numerous dead ends, he punted to Brodax, who finally found what they were looking for at Seattle Curtain. Or the pin hinges they needed for the copious built-in cabinetry. New ones weren’t up to Volkstorf’s quality standards and cost $5 a pair. After a laborious archival search he found a company in New York who made them back in the day. The minimum order was 300 but they were only a quarter apiece. “A lot of times, these old places say, ‘That’s not a problem; you can get that,’ while the new people say they’ve never seen it and it hasn’t been made in 50 years,” Volkstorf, a former cine- matographer, comments. But before they could labor over every detail, they had to find the house – No small feat. After going to a party in a Modernist house, the couple came back to their painstakingly renovated bungalow on a busy street. “We thought, Wait! 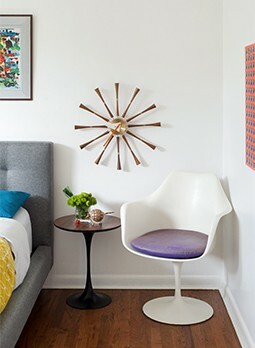 There’s something better out there,” Brodax recalls of their conversion to midcentury. How did this love affair between a couple and an unassuming home begin? Check back in part 2 to read when Cupid’s arrow first struck!